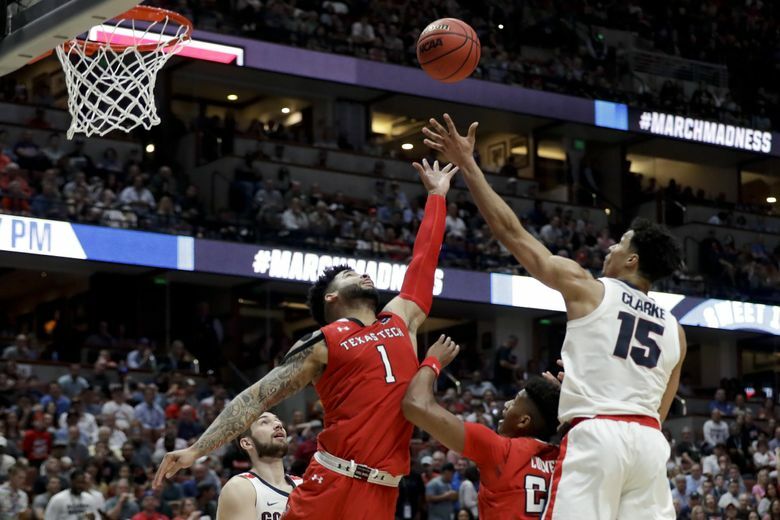 ANAHEIM, Calif. — In the corner stood Gonzaga’s Rui Hachimura, the best offensive player on the floor, getting set to launch a three-pointer that would have cut the deficit to three with a minute to go. Running toward him was Texas Tech’s Tariq Owens, the best defensive player on the floor, who was hell bent on closing out the game and sending his team to the Final Four. The contest was billed as the country’s top-rated O squaring off against the country’s top-rated D — the premier scorers vs. the premier stoppers. And if you wanted to know which skill set prevailed in this Elite Eight matchup, that play summed it up. Covering about 10 feet in one leap, Owens blocked Hachimura’s shot and kept possession of the ball (he actually stepped out of bounds, but the officials didn’t notice). That led to a Gonzaga foul, which led to a made free throw by Brandone Francis, which gave the Red Raiders a three-possession lead. A frenzied 40 seconds that included two Texas Tech turnovers, a clutch Gonzaga three and a deflating technical foul ensued — but if you’re looking a microcosm of the Red Raiders’ 75-69 win, that rejection was it. Simply put: The stoppers bested the scorers. Every player in the Gonzaga locker room was sullen after the game, but the hardest to console was senior Josh Perkins. After making a layup to get his team to within five, Perkins knocked down a three off a Texas Tech Turnover with 22 seconds to go. But 10 seconds later, with top-seeded Gonzaga trailing, 71-69, Perkins reached across the baseline and knocked the ball away from Texas Tech’s Matt Mooney as he tried to inbound it. Automatic technical foul. The third-seeded Red Raiders made their two free throws, kept possession of the basketball, and soon celebrated the program’s first trip to the Final Four. It wasn’t on Perkins, though. Before his technical, the Zags had maybe a 15 percent chance of winning that game. His blunder simply reduced it to a .15 percent chance. Perkins wasn’t responsible for Gonzaga (33-4) committing 16 turnovers, tied for its second-most of the season. He wasn’t responsible for Gonzaga going seven of 26 from three-point distance, especially considering he hit 4 of 9 from deep. Texas Tech snatched the ball away from big man Brandon Clarke six times, took away the post game in the second half, and forced the Zags to use every second of the shot clock. The team that played best came away with the win. That’s all that happened Saturday. Hachimura, the junior who finished with a game-high 22 points, will almost certainly skip his senior year to turn pro. Clarke, the junior who finished with 18 points, 12 rebounds and two blocks, will almost certainly do the same. Throw in Perkins’ graduation and you can see why Edmonds native Corey Kispert was particularly dejected after the loss. Gonzaga has a tendency to field an A-list team regardless of who leaves the program. This was the third season in the past five in which the Zags have reached the Elite Eight, and they made the national final in 2017. But that’s not on players’ or coaches’ minds right now. Right now, they’re thinking about that trip to Minneapolis that will never come to be. Like it did with so many possessions Saturday, Texas Tech took that away.